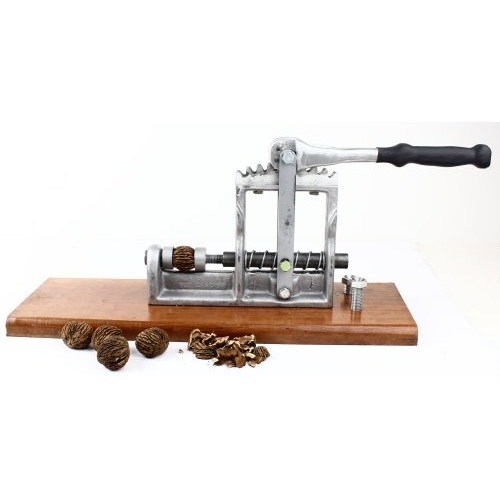 Macadamia Nut Cracker - Black Walnut Cracker for Serious Nut Crackers! Macadamia nuts can be very hard to crack because the nutmeat is so close to the shell. Too much pressure and all you get is a bunch of broken pieces. Not enough pressure and you end up yanking and pulling to try to get the too big nutmeat out of too small of a hole. GRRR! The multi-geared Macadamia Nut Cracker can reduce the amount of over/under cracking by being able to manually adjust the tension before cracking. A little practice and you'll be knocking out whole macadamia nuts like a machine! This cracker is also excellent for filbert nuts/hazelnuts, black walnuts, chestnuts, and even pecans. It comes with two sizes of cracking cups so whichever size works best for you. quality parts and machining. Love it.